"Migrating to this planet in their subtle bodies, many of our forebearers traveled through the Sun. The beginnings of mankind's mission on this planet came in a far-away time, when the atmosphere was dense with waters and gases. Flowers and animals were larger and more exotic than today. At first the transformation from etheric to physical form was difficult, but ceremonies evolved which, using the fragrances of fruits and flowers, brought devotionally to special pedestals, assisted in bringing through beings who absorbed these organic essences to materialize a denser, earthly, fibrous body. These beings loved the many jewels and golden ornaments that were crafted to bedeck and help support their flexible forms. Human life did not evolve from lesser earthly species. Aum." From The Lemurian Scrolls by Subramuniya and Satguru Sivaya Subramuniyaswami. Summary: In this essay we presented a new theory of evolution of life and consciousness through the four Yugas, stating how consciousness descended into the human body and souls became embodied in gross matter through successive stages. According to Hinduism, Time (Kala) is a manifestation of God (Isvara). In his absolute state God is timeless, eternal, permanent, unchangeable, indestructible, and without movement and duality. Being indivisible, the divisions of time do not exist him. However, it exists in him as an indistinguishable and indivisible aspect. In the projected worlds, it becomes divisible and manifests as a cyclical and repetitive phenomenon. In creation, Time is the foundation of life, order and regularity. It serves many purposes. Because of Time, beings experience change, aging, death and rebirth in the mortal worlds. It is also considered a force of Nature and the source of change, movement, instability, and impermanence. In Saivism it is regarded as one of the finite realities (tattvas) of Nature. Self (Purusha) and Nature (Prakriti) are both eternal. However, in the field of Nature the Self is subject to the illusion of transformation, movement and activity. When it transcends the limitations of space, time, knowledge, wisdom and strength, it becomes the immortal Self. In Hinduism Time is not linear, but cyclical, just as the days and nights, seasons, months and years. Because of Time, creation itself becomes cyclical and repetitive, with each cycle having a beginning and an end, and progressive phases of evolution and involution. While we cannot predict the events on the timeline of the earth or the cosmos, we can predict the recurring events of Time such as days and nights, months, years, seasons, the movements of the sun, moon and stars, and so on. The Puranas divide each cycle of creation into four divisions or epochs, called Yugas. Together, they constitute one Mahayuga (great epoch). Each Yuga has a specific time frame, a definite purpose and certain characteristic features which distinguish it from the others. Their sequence is fixed. The time frame of each Yuga varies. The four epochs are stated below. Thus, each Mahayuga, comprising the four Yugas, has the duration of 4,320,000 earth years. According to our scriptures the world has already passed through the first three Yugas, and currently it is passing through the fourth one namely the Kali Yuga. At the end of it, the world will come to an end in a great conflagration. 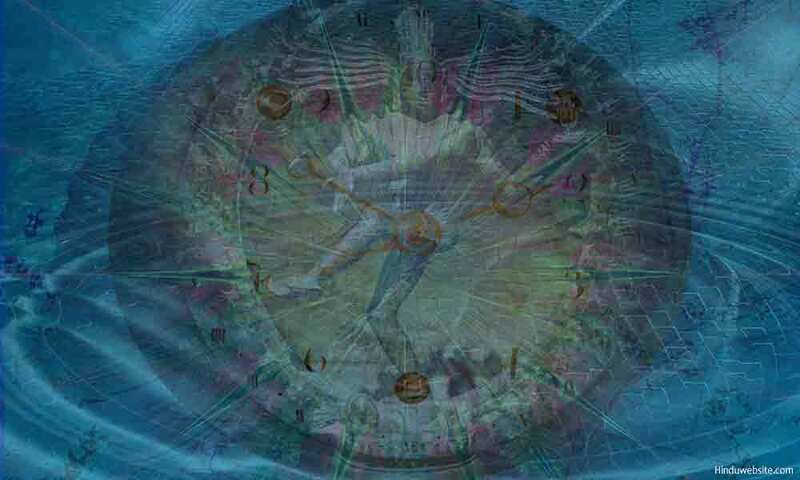 There has been a lot of speculation regarding what each of the Yugas represents, when they began and ended, and which phase of the Kali Yuga the world is presently passing through. Many try to justify them with historical evidence but with little success. Absence of concrete evidence is the main reason why the concept of Yuga does not appeal to the intellectual minds. For example, according to the theory of Yuga, our civilization must be at least four million years old. However, there is no evidence that human civilization existed that long. The earliest remains of the human civilization are hardly 30,000 years old. Further, there is no archeological evidence suggesting that great civilizations existed in the past, as early as four million years ago. The skepticism leaves us with just two possibilities, either the descriptions of the four Yugas as found in the Puranas are figments of human imagination or the existence of life upon earth in the past ages must have happened differently in an alternate reality, which was very different from the current one. We believe in the second possibility. Hence, we present an entirely new theory of the four yugas. We believe that human souls appeared upon earth long ago but they became embodied in physical bodies only recently. While lower life forms acquired physical bodies millions of years ago, human beings acquired them only from the beginning of Kali Yuga. Until then they had astral bodies or remained in subtle forms. According to this theory, human beings in Satyuga were pure and divine. As time went by, the souls came under the influence of Rajas and Tamas and grew increasingly impure. First, they developed subtle bodies and possessed divine qualities. Later, after a few million years, they developed gross bodies and grew increasingly materialistic, whereby they lost their purity as well as knowledge of their spiritual nature. Thus, we are products of a long physical evolution and spiritual involution. We grew bodies but lost touch with our souls, and from divine beings we devolved into human beings. If our prediction is correct, the world will further descend into darkness before it comes to an end. In the following discussion, we present the new hypothesis to suggest how human souls continued their existence through the four Yugas in subtle forms and eventually ended up as physical beings, with limited abilities. However, before we go into the details, let us examine the composition of the human personality and its distinction as explained in our scriptures such as the Vedas. They declare that human beings possess not only physical bodies but also four other subtle bodies. The physical body is what we see and relate to, while the other ones are subtle remain hidden. We cannot perceive them in others except through inference, but we can subjectively perceive them within ourselves. The scriptures describe them as Kosas 1 or sheaths. However, it is not true that they are present in us as sheaths or layers. They have distinct features, but they do not exist in us as distinct parts with clear boundaries. Since they are well integrated in us, we cannot isolate them. However, we can internally know that they exist in us and are different from one another. Starting from the outer, the five bodies are as stated below. Annamaya Kosa, the gross physical body. It is made up of the four elements present in the food. Pranamaya Kosa, the pranic or breath body. It is made up of Prana or life energy. Manomaya Kosa, the mental body. It is made up of thoughts, desires, emotions, feelings, etc. Vijnanamaya Kosa, the intelligence body. It is made up of pure intelligence. Anandamaya Kosa, the bliss body. It is made up of pure bliss, the natural state of the souls. Let us now examine how these five bodies progressively manifested as the souls became embodied during the four Yugas and how pure souls ended up as impure humans. We believe that in Satya Yuga or the age of Truth, the embodied souls had no visible or tangible physical bodies. They were the purest of souls from the previous Time Cycle, who were most recently drawn into the field of Nature for the purpose of creation. They had only one body, the bliss body. Hence, they enjoyed bliss as their natural state, and had omniscience. Since they were pure and without impurities, they abided in truth and lived virtuously. Beings of this age had godliness and divine qualities as their natural state. They possessed only Sattva and lived like gods upon earth, who could easily enter the subtle worlds because of their pure consciousness. They were also seers and knowers of the Self, to whom truths revealed themselves, as they withdrew into the blissful state of the Self. Although they had no dense physicality, because of the purity of their intention they could assume astral bodies if needed. Since they were free from impurities, they had longer lifespans and lived for hundreds or even thousands of years. As the name implies, beings of this age were truthful, and free from selfish desires, lust, anger, pride, greed and envy. They lived virtuously and adhered to Dharma. Since they subsisted upon pure Prana, they possessed supernatural abilities (siddhis), with which they could perform superhuman tasks. They were so pure and divine that gods treated them with respect and occasionally sought their help to fight the Asuras (demons). As stated in the epics and the Puranas2, the ancestors of Rama and many of their contemporaries participated in the battles of gods as their allies and fought with the demons. Treta Yuga, the age of intelligent beings. Satyuga was followed by Treta Yuga, which was the age of virtue and wisdom. During this age, the souls developed intelligence bodies. Hence, they had discernment and insight into the nature of things. Although they did not possess physical bodies, they had astral bodies, which were subject to modifications such as aging and sickness. Sattva was predominant in them, with traces of rajas and tamas, which occasionally subjected them to selfishness, egoism and loss of discretion. Beings in this age still retained much of their purity and divine qualities and could enter the subtle worlds to communicate with gods. At the same time, due to the presence of impurities they lost awareness of their bliss bodies, which subjected beings to suffering and delusion. The age also witnessed the decline of Dharma, which walked on three legs only instead of four. People pursued mostly three of the four aims namely Dharma, Artha and Kama, and ignored the fourth, liberation. As time progressed, evil beings from demonic worlds appeared on earth in this age and created disorder and suffering. The conflict between gods and demons intensified and extended into the microcosm of the humans upon earth whereby they became vulnerable to evil influences. The age witnessed the rise of mighty beings such as the Vanaras, who had supernatural abilities, who could challenge even gods. Overall, it was the age of light and wisdom. Treta yuga was followed by Dwapara yuga, during which the souls acquired mental and breath bodies. In all, they had three or four bodies namely the bliss body, intelligence body, mental body and Pranic body. They probably had dense astral bodies and subtle senses, which led to their increasing involvement with the external world. In this age, people had the predominance of sattva and rajas. Hence, they had mixed qualities of light and darkness. Because they had active mental bodies, they became susceptible to emotions, feelings, egoism, delusion, pride and selfishness. Beings were still virtuous, but had their own weaknesses. It was the age in which humans developed both divine and demonic qualities as enumerated in the Bhagavadgita. Those who had the predominance of Sattva lived virtuously and worshipped gods or God, but others engaged in desire ridden actions, worshipped lower gods, and accumulated sinful karma. Due to the presence of impure gunas, Dharma walked on two legs only. Although most people were virtuous, traces of darkness lurked in their minds and bodies as Tamas began to exert its influence over their minds. Due to ignorance and delusion, they lost their discernment and ignored their obligatory duties. Virtue still reigned, but virtuous people like Bhishma, Dharmaraja and Vidura were few. Even their judgment was often colored by selfish desires and worldly concerns. Warriors like Arjuna and Karna were able to summon their mental powers to unleash mighty weapons against their enemies, but they were subject to negative emotions such as anger, envy, fear or sorrow. Seers and sages had control over their minds and bodies and led pious lives, but they could be tempted by gods and led astray. Kali Yuga is the last of the four Yugas. It is also the shortest, with a span of 432,000 years. The world is currently going through it. In this age, Sattva becomes suppressed while Rajas and Tamas predominate. Of the three, Tamas became the most dominant. Because of it, people in this age have dense physical bodies, while their subtle bodies are clouded by intense darkness, which make them vulnerable to evil influences and sinful actions. We can see that in today's world most people are obsessed with their bodies, looks, names and forms, while they are motivated by sexual desires, worldly possessions and sense gratification. Of the four human aims, they predominantly pursue sexual pleasure (kama) and material wealth (artha), ignoring their righteous duties (Dharma) and the pursuit of liberation (Moksha). Truly speaking, Kali Yuga is the age of gross materialism, in which people regard their material possessions as part of their identities. As consciousness penetrates farthest into matter, people lose the knowledge of their spiritual nature and fully identify themselves with their minds and bodies. It is not difficult for us to see how desire-ridden actions and excessive materialism have disrupted the order and regularity of our world. People now have better awareness and knowledge of the world, but cannot easily relate to the spirit which resides in them. Excessive materialism and decline of Dharma led to the ascendance of demonic qualities. The age is truly the age of Asuras. The Asuras who were hitherto living in the demonic worlds now very much reside in our subtle worlds and influence our actions. People nowadays have little respect for the eternal laws of god, nor fear of retribution for their sinful actions. Hence, this is also the age of tamasic darkness. We have expanded the horizons of our perceptual knowledge far into the material universe, but we cannot look deep within our personalities to know who we truly are. Our consciousness is now so mixed up with our physical identities and egoism that we have lost much of our divinity, humanity and virtues. Dharma in this age walks on just one leg. We pursue the four aims to strengthen our egos and establish our influence and control over others rather than to pursue liberation. The Puranas state that in Kali Yuga evil will reign and chaos will increase until it becomes utterly unbearable for life to thrive, as increasing number of demonic and asuric souls begin to take birth on earth and indulge in evil actions. God will release the worst of the souls into the mortal world to give them one last chance to redeem themselves. In the end, there will be a great destruction, during which the bodies of all the embodied souls will be completely destroyed and the souls will be withdrawn from the field of Nature. It will be followed by a period of rest, after which a new cycle of creation will begin. From the above we can see that the four ages represent the gradual evolution of denser human bodies upon earth and involution of their spiritual nature. As Time progresses from one epoch to another, people grow increasingly materialistic and correspondingly less spiritual. Their focus shifts from within to without. They become increasingly drawn into materiality and become bound to the cycle of births and deaths. Here is a brief summary of the theory we have presented so far. In Treta Yuga, people developed intelligence bodies and had weak astral bodies, which were made of fine energy. They had discernment, abided in Dharma and lived virtuously, although at times they were susceptible to bad judgments due to past karma, selfishness and the increasing influence of Maya. In the Dwapara Yuga, people developed mental bodies, breath bodies and dense astral bodies. Still, they did not possess physical bodies, but had definite forms. Due to the presence of gunas they were susceptible to conflicting emotions and selfish nature. It was the age, in which people had a mixture of divine and demonic qualities. In Kali Yuga, beings developed well-built physical bodies which are sustained by breath and food. Due to their past karmas and the activity of the senses, they became more involved with material things and lost much of their purity and divinity, while their minds and bodies became clogged with the impurities of egoism, delusion and attachments. We are currently going through this phase, and we can expect that as time goes by the world will become increasingly filled with evil and fall under the influence of the Asuras, who believe that the body is the soul and there is nothing beyond this life. They destabilize the world, spread anarchy and violence and precipitate divine intervention to restore order and regularity. Corresponding with the evolution of the bodies, there was a devolution of spiritual consciousness. In the first age consciousness and self-awareness were confined to the soul body or the bliss body. In the second age, they extended into the intelligence body. In the third age, they further expanded into the mental and bliss bodies. Finally, in the Kali Yuga consciousness penetrated deep into the physical bodies whereby the body became the center of the human personality and the field of Maya, and humans lost touch with their spiritual nature and hidden selves. We do not have historic data to corroborate the events that took place in the Ramayana and the Mahabharata or the legends from the Puranas. There are certainly some incidents in both the epics which suggest that they might have had some historical basis, but we cannot conclusively establish them with factual evidence. We believe that the two epics did not happen in the physical world, but probably in the subtle worlds, when humans did not yet develop their physical bodies but possessed only subtle bodies. The same may be true with regard to the legends of the Puranas. They happened at a time when humans possessed ethereal, astral bodies or casual bodies, which were created and shaped by their karma and past life impressions. Civilization existed but in the subtle planes. Since they did not happen in the physical world, we do not have physical or archeological evidence to substantiate them except through vague coincidences. However, since they happened in our ancient past, when we were still evolving through subtle planes and our consciousness was descending outwardly into physical matter, we might have retained their memory in our collective consciousness, which the seers of our past envisioned in their intuitive minds and transcribed it for our knowledge and understanding. We can still communicate with out subtle planes and enter those world through deep meditative states. However, it requires discipline and intense spiritual effort. With effort we can reverse the devolution of our spiritual nature and regain our lost spiritual knowledge of the Self, by cultivating detachment from our physical bodies and material possessions and withdrawing our senses into our minds, our minds into intelligence, and our intelligence into the Self which is hidden in each of us. With effort, in just one lifetime we can reverse the devolution of consciousness which happened over four million years and through the four yugas. 1. (For more information on these bodies please read the section on "The Constituents of Man - the Jiva", available at this site). 2. It is not this author's contention that the Puranas are authentic sources of history. But they do contain distant memories of the past and broad outlines of the history of ancient civilizations that existed in the remote past not necessarily of the present time cycle of this planet alone but previous ones also.